Great product and great price . Many thanks. Service 2nd to none. 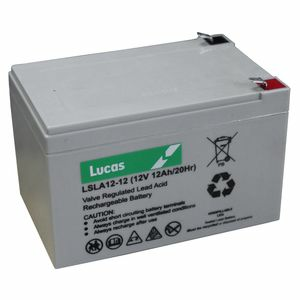 A pair of these batteries were fitted into my Wife's Disability Scooter, which brought it back to life. The battery holder on the scooter has to be unscrewed, which then reveals which battery type you require. Battery arrived within two days well packed and works fine. Runs like a dream now. And cost great. Great service and fast delivery, well pakaged. Only needed minimum charge to be ready to use. Since fitting scooter has been running well. Mother in law very happy. Great strong little battery. Excellent efficient service from yourselves and speedy delivery too! Very prompt delivery, fitted batteries to my Pride Scooter, all ok At the moment very satisfied with service will use it again and recommend it to others. Thanks. Great, quick delivery, well packaged and came fully charged. solid product. does the job fine. Used to power a light. Excellent. I use it for moth trapping equipment - easily portable. The service was excellent too.